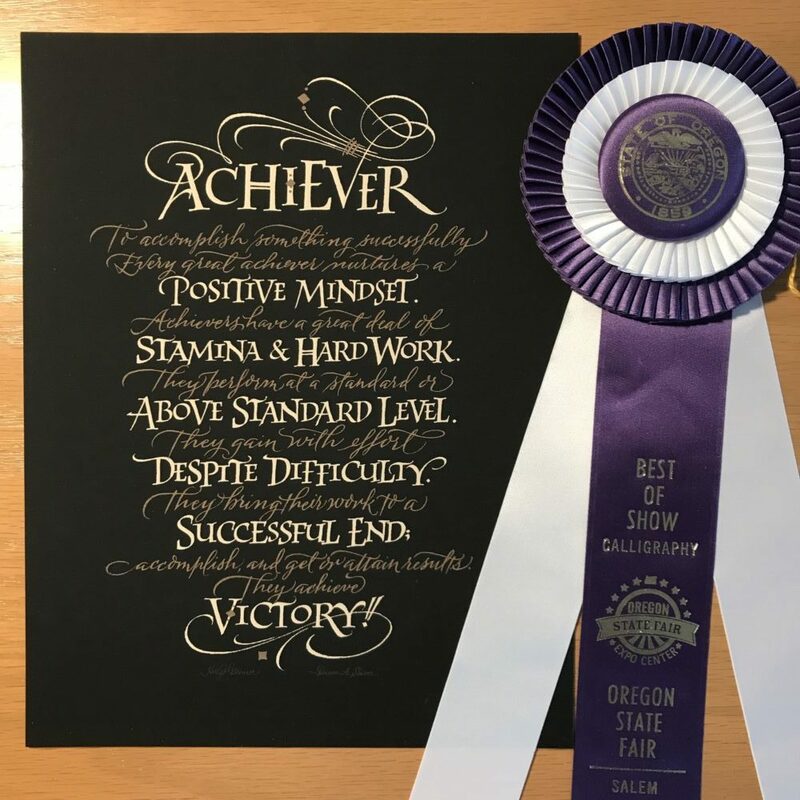 This entry was posted in Artwork, Events, Press, Showcase and tagged award, Best of Show 2017, Black paper, Calligrapher, calligraphy, Calligraphy Division, gouache, Holly Monroe, Oregon State Fair, Portland Society for Calligraphy, Romans, Script. Bookmark the permalink. Holly, this is absolutely wonderful! 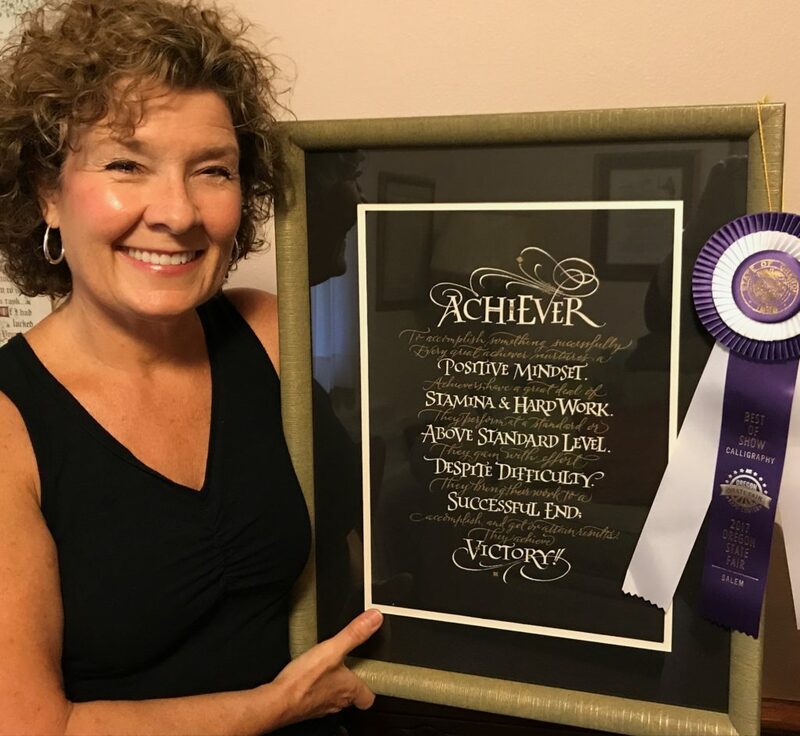 Hearty, well deserved congratulations to you for the outstanding Best of Show. And better yet the birth of your grandson. My thoughts have been with you so often. Judy you are a dear. Thanks for your kind note. I do hope to cross paths again soon! I\’ll come back to teach in Florida, any day! Or maybe just to vacation! Congratulations, Holly. Everyone who has one of your works of art already knows you are a winner. God Bless you and Congratulations on your new Grandson. Nancy, so good to hear from you my friend! Blessings back to you….I hope that all is well in your world. Yes, I can\’t wait to see that little grandson. I travel this week. Rich! Thank you. How are you doing? What is your latest piece with you scratchboard art? Congratulations, Holly! I’m not surprised that you snagged such an honor, as your work is stellar. Brava! Thank you Jeannine! So good to hear from you. I guess school has started for you!